When I think fall, I still think cuddling up by a fire, fuzzy socks on and hot chocolate in hand. Unfortunately (or fortunately depending on how you look at it) this 80 degree Hawaii weather says different. With all the yummy recipes associated with this time of year, I don’t want to feel as though I’m missing out on some of my favorites. Anything pumpkin flavored–send it my way. But piping hot soups and stews just really don’t sound appealing in this climate. I’m looking for other ways to use fall ingredients and not die of heat stroke. 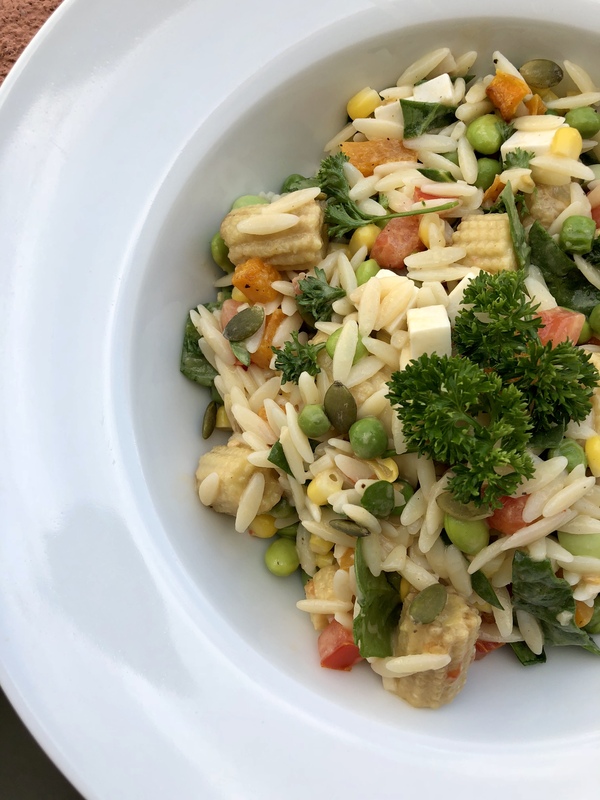 And TADA– this butternut squash orzo salad was born. Pasta salads in general are nice for using up those last bits of ingredients that are taking up space in your freezer, or going bad in the fridge. For example, from my freezer came edamame beans, sweet corn, and peas. A pesky can of baby corn I couldn’t find a use for also found a new home in this salad (and then in my belly). Traditional pasta salads usually are tossed with feta cheese, I looked for a vegan option at whole foods but had no luck. 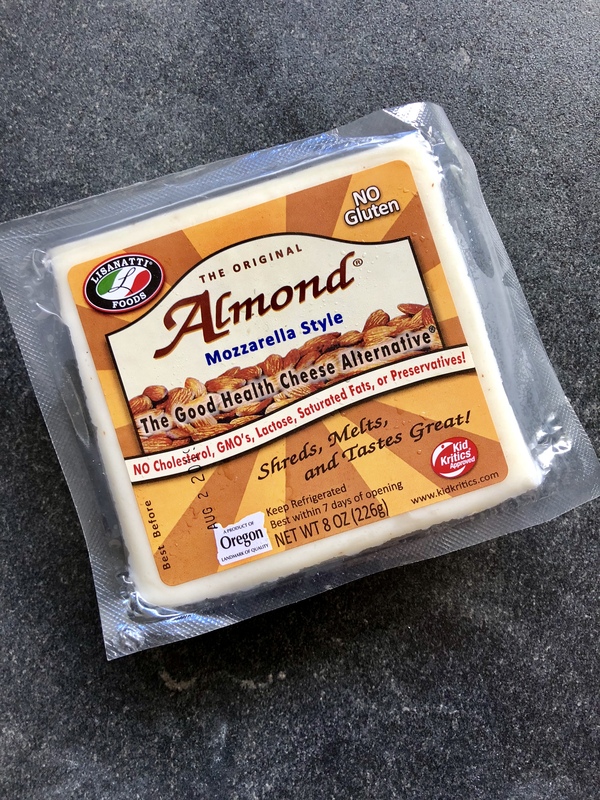 I settled on an almond mozzarella and I was pleasantly surprised! This brand was considerably more affordable than other vegan cheeses and really adds something to this orzo. It’s not necessary, but highly recommended. a food processor would work well also! Cook the orzo according to the package in the same pot with frozen veggies while you prepare the squash. Chop squash in to small bites and toss in olive oil, salt and pepper. Roast at 425 degrees for 30 minutes or until soft. When orzo and squash are cooked, chill in the refrigerator until cool. Drain and rinse baby corn, chop into smaller pieces. Chop tomato, vegan cheese, and spinach. 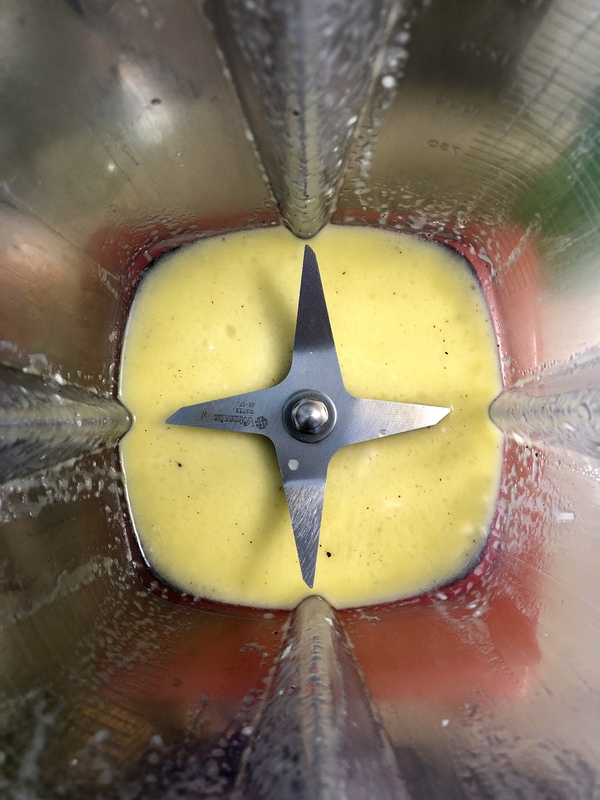 For the dressing, put lemon juice, garlic, salt and pepper in to blender or food processor. Stream in olive oil and blend until fully combined. Toss all ingredients together and season to taste. Your orzo is ready! Enjoy 🙂 I topped mine with a few pumpkin seeds for some crunch. ← simple vegan green curry.